Breaking games apart and analyzing them in depth. Been awhile since we've had one of these, eh? Let's get some images, too. Images that aren't screencaps of my own games. Oh man that's so much better. 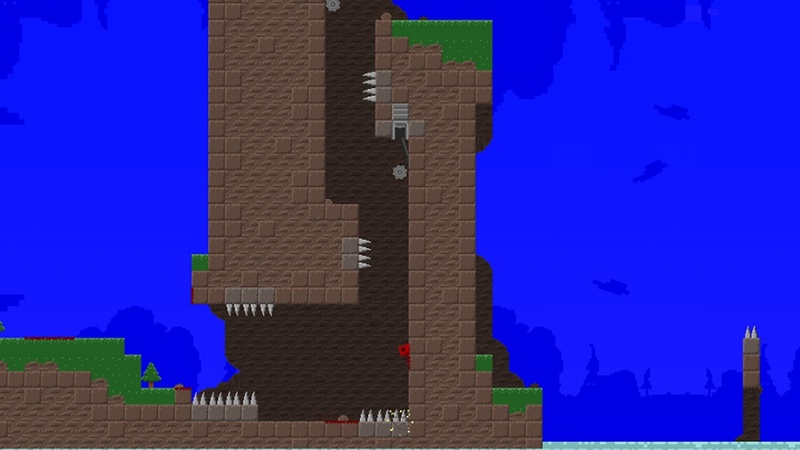 Super Meat Boy is a truly fantastic indie platformer that came out a few months ago. It's available here, though if you haven't played it by now, it may not be your cup of tea. You see, Super Meat Boy is hard. Hair-tearingly soul-crushingly ridiculously hard. 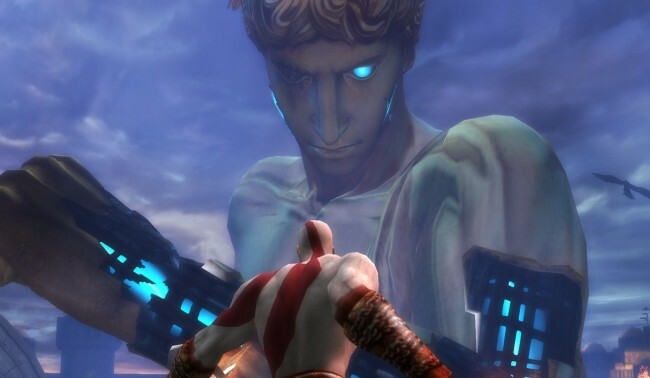 It is one of the harder games that's come out in the last decade or so. What happened a decade ago? We learned that games should probably be possible. It might not seem like we had to learn that, but, trust me, we did. For a long period of time, games weren't meant to be possible, they were meant to eat your quarters forever. The more quarters you could convince someone to feed into your arcade machine, the more money you made. This culminated with a rather notorious boss in the Dungeons and Dragons arcade machine that would literally take no damage until you'd put in twenty quarters. That's right: you have to pay five bucks to start killing the boss. Eventually games moved on to consoles and computers, and people stopped having to feed quarters in, and eventually we realized, hey, why not make games have an end? Then it turned out that if you spent a lot of money putting an ending in your game, maybe it was a good idea to, like, let people see it, and so games got a lot easier in the space of a few years. So they made Super Meat Boy. Super Meat Boy is a throwback in a lot of ways. First, in terms of its difficulty. But most obviously, its art style. 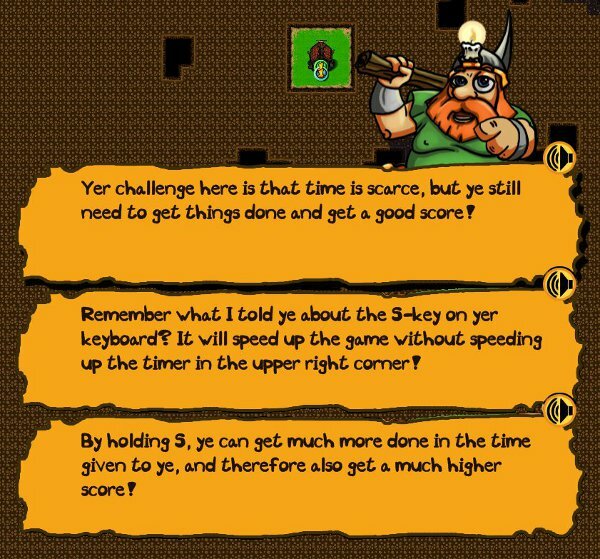 It could be described as "relentlessly retro" – the game is firmly grid-based, the pixels are large and chunky, everything about it says "this is a retro game". And some parts scream retro. Limited palettes, small assortments of tiles, even less bending of the grid formula. There's slopes in the previous two pictures. There's no slopes here. We don't need slopes. We've got blocks. What I find most fascinating about Super Meat Boy's art is that it's far, far, far more complex than anything you could do on . . . say . . . a Super Nintendo. Deceptively so. Super Meat Boy's art isn't 16-bit art. It's modern, hardware-accelerated DirectX graphics . . . carefully crafted to be strongly reminiscent of old game consoles, while not actually being old game console art. And curiously, it takes on several "16-bit conventions" that didn't actually exist back in the 16-bit world. 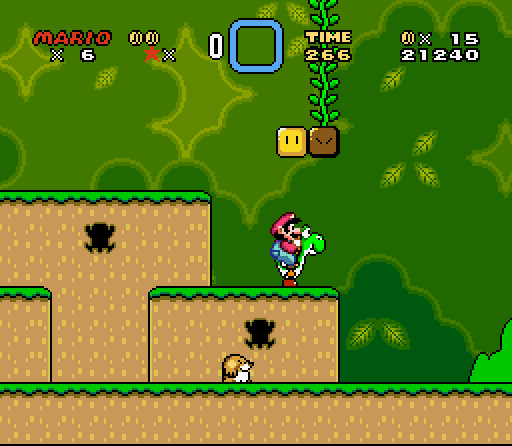 Take a look at an actual 16-bit game, Super Mario World. (In the series Super Mario Brothers. You may notice that Super Meat Boy has the same initials. I would be shocked if this were a coincidence.) Look at what's going on this screeenshot: rounded corners everywhere. The platforms have rounded edges, the blocks are rounded squares. None of that translates into the actual game physics – every ledge behaves like it's a sharp 90 degree angle, the rounding is just there to give it some fancy looks. The floor, and the platforms, have some art going on to give them a little more depth. The background has coloring designed to fake you into thinking it has a lot of depth. Bushes in "front" are darker, bushes in "back" are lighter, and it's all fluffy to make it hard to recognize the tile boundaries. Two more: Donkey Kong Country and Tales of Phantasia. 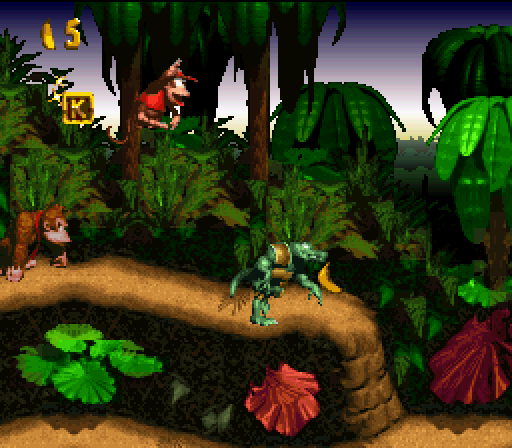 Look at DKC, first. 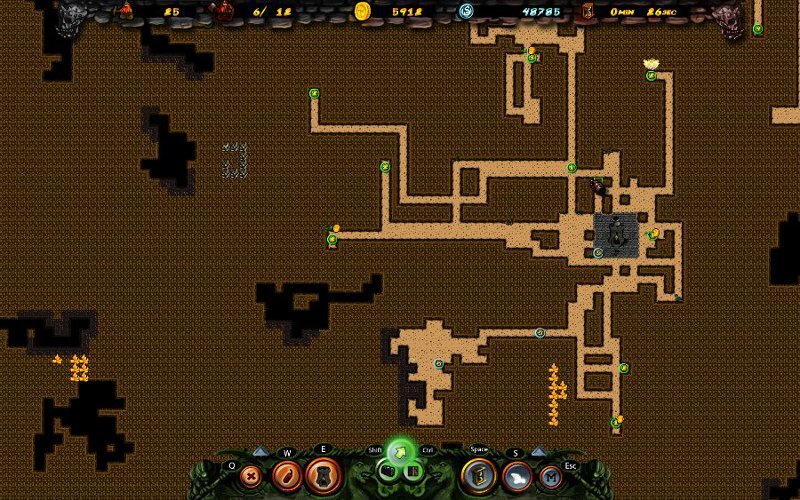 See just how impenetrable the actual level layout is. There's all kinds of crazy fake-perspective and cleverness going on here – you can't even see the underlying grid. This game makes great use of parallax – as you run, the backgrounds scroll at a different rate, to give an impression of depth. 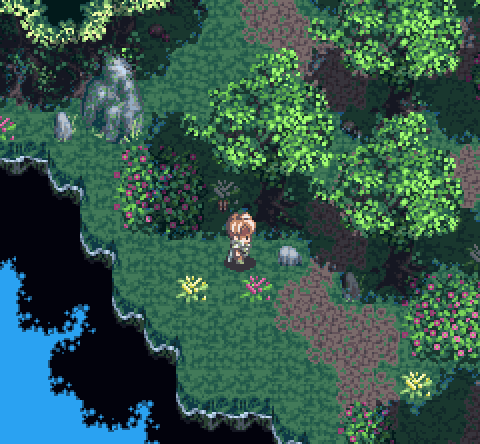 Tales of Phantasia doesn't do as good a job of hiding the grid, but look at how many tricks they're using to make it still look great. Fake 3d, shadows, objects that don't conform to the grid quite like you'd expect. The grid still exists, but the collision layer doesn't conform directly to it – the collision layer is more complex so they can make rough edges. The grid is still there, they just try to hide it. It's all smoke and mirrors. 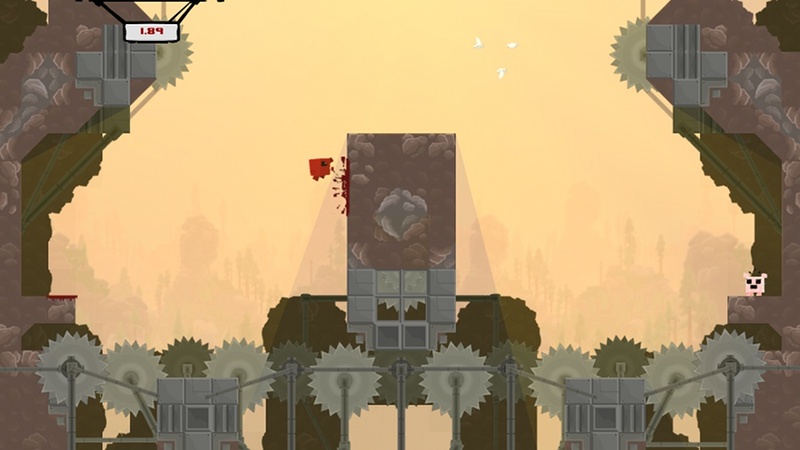 Super Meat Boy dispenses with the smoke and mirrors. Platforms have hard edges. There's no fake lighting effects on the platforms themselves, just splashes of red where you walked (Super Meat Boy is a boy who has no skin, and as such, he leaves blood everywhere.) 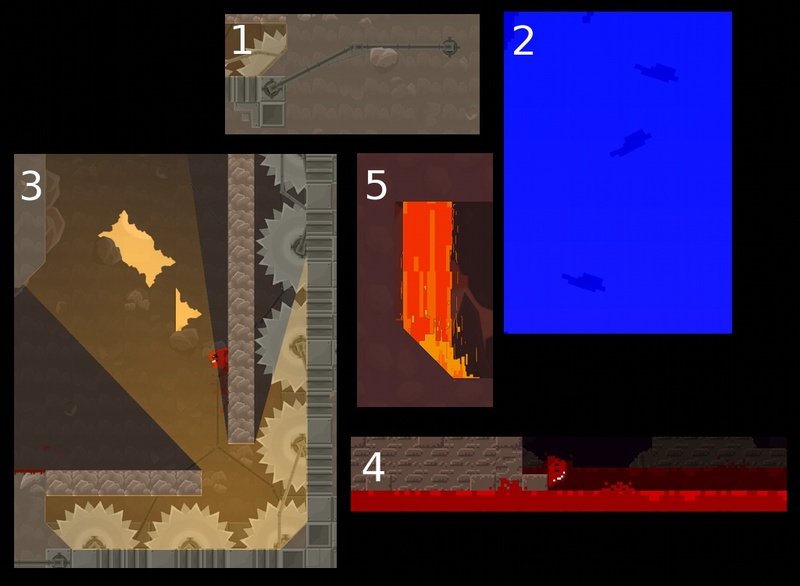 There's often multiple layers of background, as you can see in the first image, but there is a hard divide between the "background layers" on the same plane as Super Meat Boy and the background layers deep, deep behind him. The same-plane background scrolls at the same rate as Super Meat Boy does. The deep background layers are much, much, much slower, giving an illusion of depth with no risk of confusion. The real 16-bit games did everything they could to escape their 16-bit nature. They pulled every graphical trick and programming trick they could. The modern "16-bit" games revel in it. The sharp corners are emphasized instead of hidden. The backgrounds are set apart from the foregrounds. It's not about immersion, because if they wanted immersion, they wouldn't be making a 16-bit game. It's about a feel and a concept. The funny part is when they start using techniques that the "16-bit" games couldn't use in the first place. 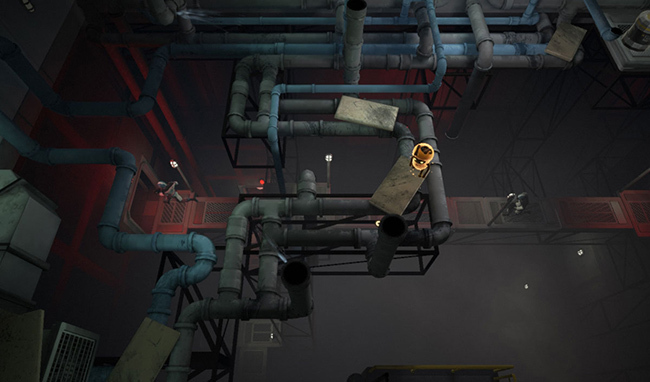 1: Take a look at the left side of that pipe. You see the tricky thing? The Super Nintendo couldn't do that. The Nintendo absolutely couldn't. Easy use of rotation only showed up as of the PSX era, deep into the realism push. 2: The contrast is a little tricky here, but this comes from the third screenshot up above. It's the same deal as #1: rotated clouds. These clouds zip around the level wildly while you're playing. That's not a 16-bit effect, that's a modern hardware accelerator. Can't fool me! 3: Super Meat Boy has some really wonderful lighting effects. In this case, the pit below Meat Boy is emitting light, which is pouring up through the hole and illuminating everything. Again, this is the kind of thing that the classic consoles just couldn't do. Light compositing takes some moderately hefty hardware, and transparencies only showed up in the Super Nintendo era. In this case it's actually even worse than you'd think. 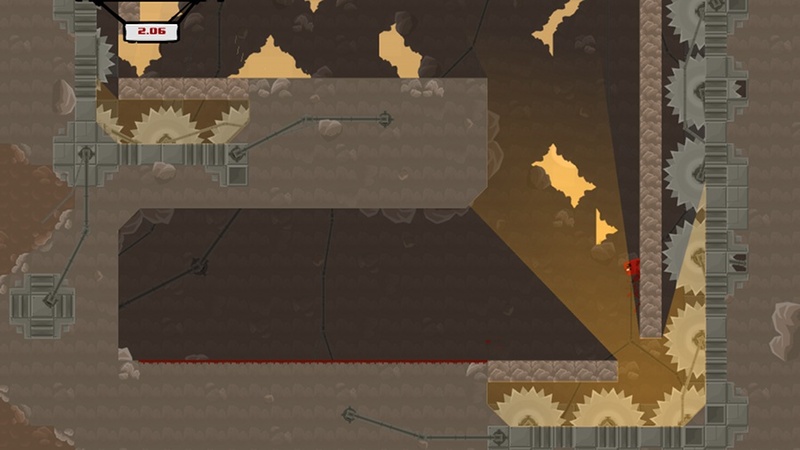 The crumbly-looking blocks that Meat Boy is gripping will actually disintegrate after a second or two of being touched, and the lighting effects adjust instantly. That sort of complex lighting is well out of reach of 16-bit consoles, but because it can be easily applied to "16-bit" worlds, and because it looks really quite awesome, it's common in games like this. See Gish for more examples of this lighting style. 4: You never see old games intentionally making the world blockier than necessary. They do everything they can to make it less blocky. 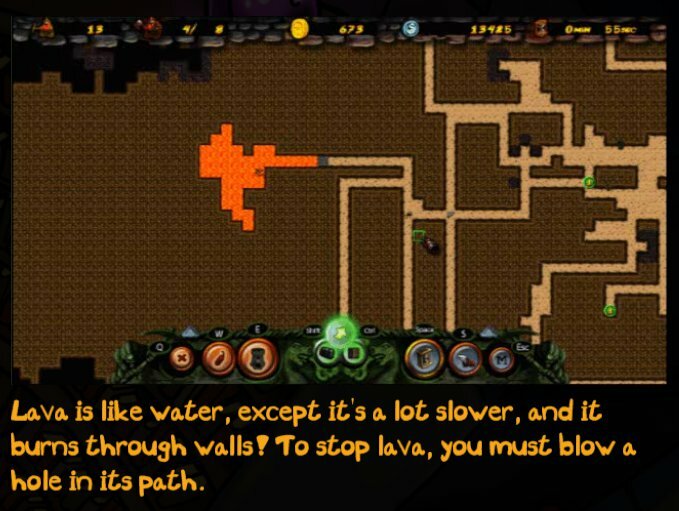 But take a look at this lava – it's obviously and intentionally chunkier than the rest of the level. Big pixels, about twice as large as the pixels on the solid objects, and they're not even grid-aligned. That's not done for the sake of the hardware. That's a pure stylistic choice. But if you want a really ridiculous example . . .
5: These pixels aren't even square! Look at them! They're ridiculously tall! And I don't even know what's going on with the pixel sizing. On the edge there's tiny, tiny pixels. In the middle there's big chunky pixels. In the fire, there's pixels of all shapes and sizes, glomped together into a flame effect that looks distinctly old-school while having absolutely nothing in common with old-school platform limitations. The fact that it's sitting on top of a beautiful and completely non-SNES 45 degree angle is just the crowning touch. Next time you're playing a fake classic game, look at all the tricks they're using to show you how old the game is meant to look. Next time you're playing a real classic game, look at all the tricks they're using to pretend the game has more detail and beauty than it actually does. This was meant to be one entry. "Oh, but Zorba, it is one entry!" No it's not. You just haven't seen the second part yet. This will be continued. 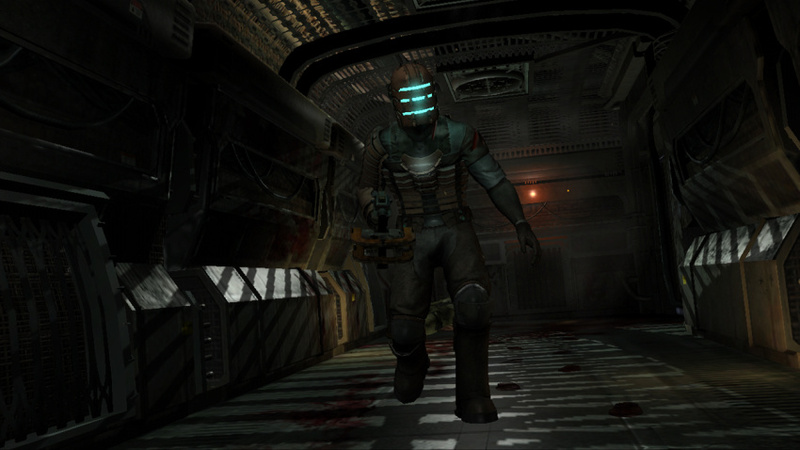 Dead Space takes place on board the the USG Ishimura, a colossal "Planet Cracker"-class mining ship. It's a ship designed to literally rip apart planets to feast on the tasty, tasty ore inside. The ship's architecture varies from tight constricted maintenance corridors to huge open industrial spaces. At various points you visit the hydroponics bay, personal quarters, the medical bay, the bridge, and pretty much the entire set of possible important ship locations. Most of the places you travel make sense in context of the ship's purpose. There's equipment suitable for its purpose, the layout is at least plausible, the lighting looks like it would be acceptable before zombies smashed up the place, etc. Some of the places do not make such sense. The ship is weirdly infested with inexplicable circuitous corridors. There are industrial areas that can best be described as mazes of walls. Why is there a maze in this ship? Did the crewmen just want a maze in their ship? There are strangely-placed high-speed trams that lead from one near-dead-end to another (the asteroid cannon being the most notable WTF moment). Why isn't, you know, there just a door which is closer? Are you seriously saying there aren't any other corridors within a kilometer? Overall, a good chunk of the ship just plain doesn't make sense. 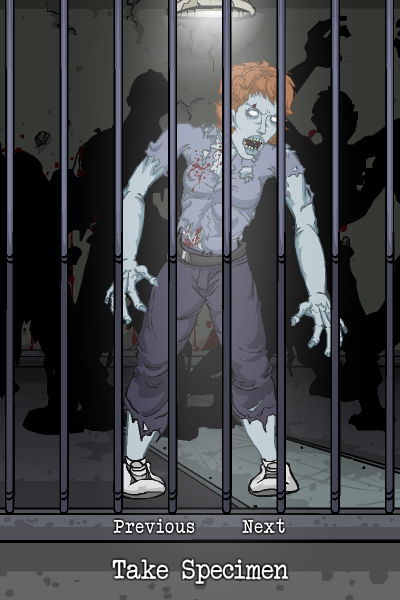 Now, if the ship were designed by zombies – yeah, sure, go for it, zombies are crazy, who knows how they'd design it. But they aren't. It was designed by people. And when you're told that you're walking throughout a human-designed spaceship, and 3/4 of the ship makes perfect logical sense, those moments when you find yourself thinking "wait, why does this area even exist?" are painfully jarring. Why does this maze exist? Well, it exists because the game plans called for a maze, and by gum, we're putting a maze in! The only fix I can think of is to be excruciatingly careful that each location makes perfect sense, both for the game and in the context of the universe. It's hard, it's really hard, but I think it's important. This isn't an issue that's restricted to games – it's something movies get constantly wrong as well (please, explain to me why the Emperor's chamber on board the Death Star has a hole leading directly to the reactor core without even a guard rail) – but that's not an excuse, it just means we get more people to laugh at when we finally get good enough to avoid it. 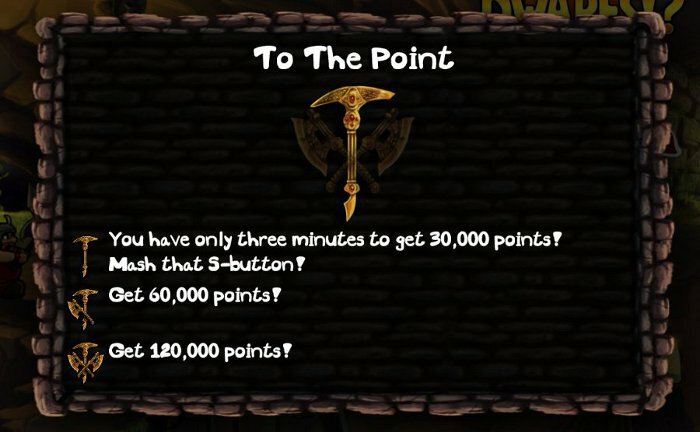 For each zone, for each object in the game, you have to answer two questions. Why does the game contain this? Why does the world contain this? If you can't come up with good answers to both questions, get rid of it. In motion, this looks pretty good. In death, it's problematic. First, unless you've gone to the trouble of multiple death animations, creatures always die the same way. If you kill five hundred Basic Guards, you'll end up with five hundred identically-posed corpses lying around. Uncool. Second, death animations have nothing to do with the weapon you kill them with. Poke them a thousand times with a needle? He'll scream, fall over, and lie with his face on the ground. Shoot him with a portable nuclear warhead launcher? He'll scream, fall over, and lie with his face on the ground. Uncool. 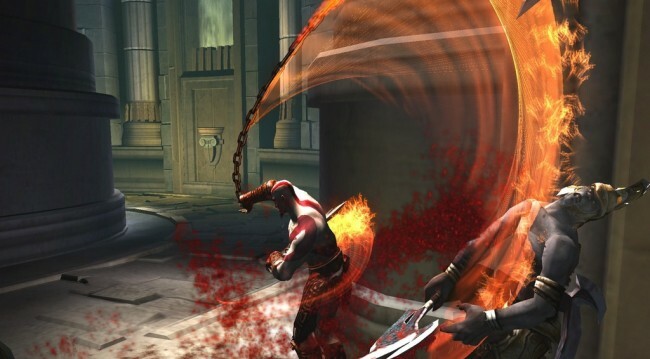 Third, death animations tend to "snap" from other animations. Basic guard takes a flying leap, jumps at you, you kill him midair . . . and suddenly he plays the Death Animation, which involves him instantly standing up in midair, then screaming, falling over, and lying with his face on an imaginary ground, while his corpse eventually falls into a pit. Uncool. There's a solution to this. 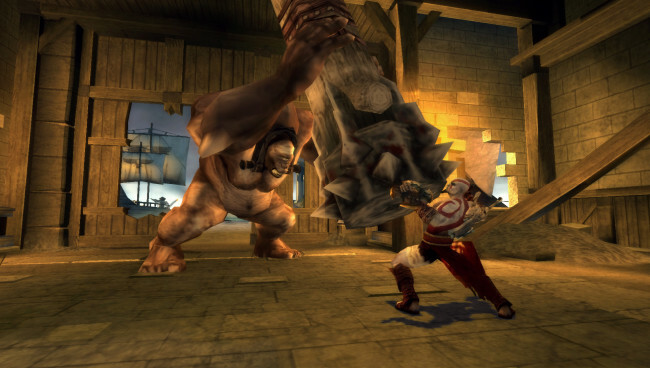 Games have gotten sophisticated enough that most modern 3d games include a basic physics engine. You don't need perfect physics for this, something simple is pretty effective. Animations are already based on a simple skeletal model – arms have two "bones", legs also have two "bones", etc – and it's easy enough to allow these bones to just move via the laws of inertia and behave properly on impact. So you kill someone on a tower of boxes, his corpse will tumble down the boxes. You shoot someone with an air cannon while he's standing in front of a railing, he'll backflip over the railing. Rocket launcher to the feet? Flying guard corpse! Cool. Ragdolls tend to be used only for actual death. 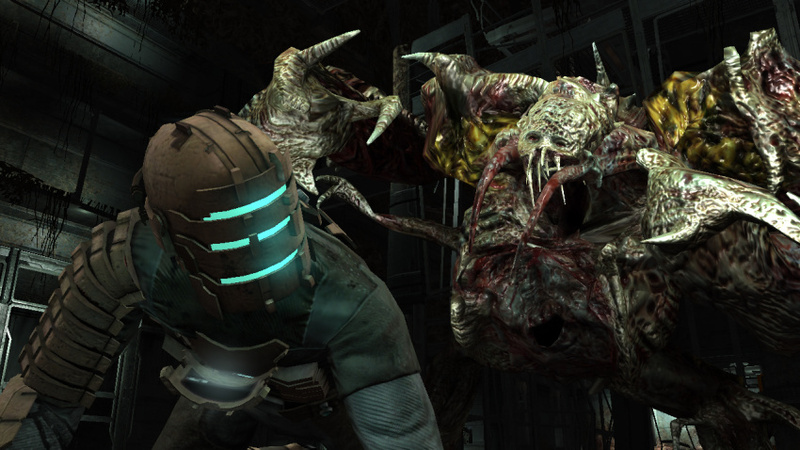 It's just too hard to recover from a ragdoll collapse if the creature isn't actually dead. 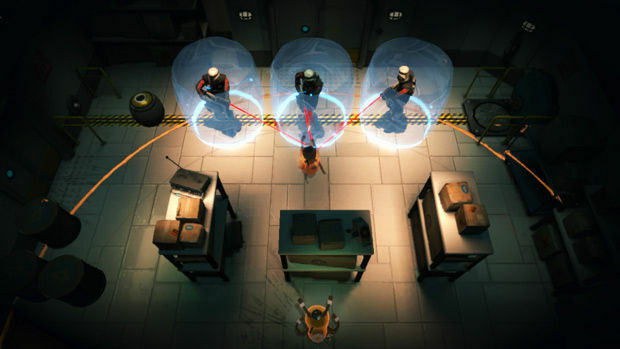 You knock a Basic Guard into a pile of boxes and he gets jackknifed between two – how does your Basic Guard recover from this? He doesn't, but now there's a living Basic Guard jammed uncomfortably into a pile of boxes. It doesn't work well. So ragdolls are only used for death. But that introduces a new, irritating problem. Ragdolls can be used to detect death. 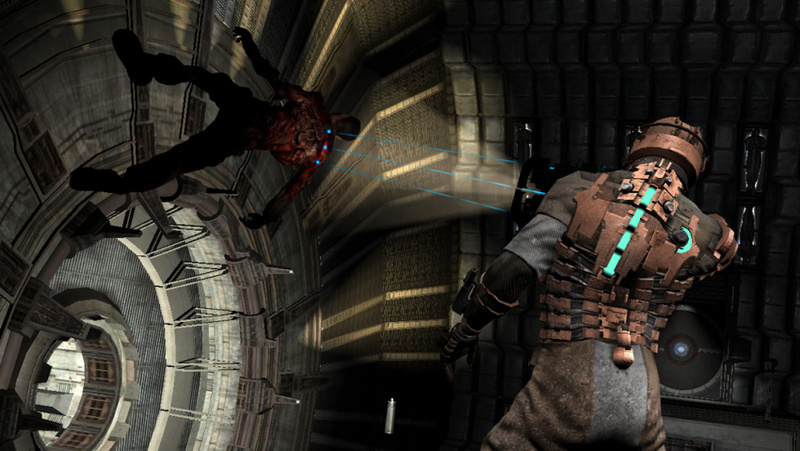 Dead Space includes a gun that fires a shockwave which knocks things down. 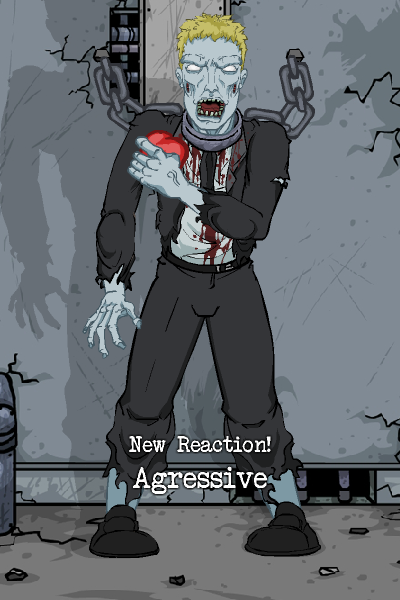 When knocked down, a lot of the zombies will cheerfully play dead, only to eviscerate you when you turn your back on them. However, it's trivial to determine if they're dead or not. See, when you knock them down, they always fall on their backs, with their legs facing you, and their left leg (from your perspective) slightly lower than their right leg. I know this very well from knocking down dozens and dozens of zombies this way. When I see them fall down this way, I know they're just going to get up again in a few seconds. When I see them fall down any other way, I know the ragdoll mechanic kicked in, therefore I know they're dead, and therefore I can forget about them. I'm not sure what the solution is. 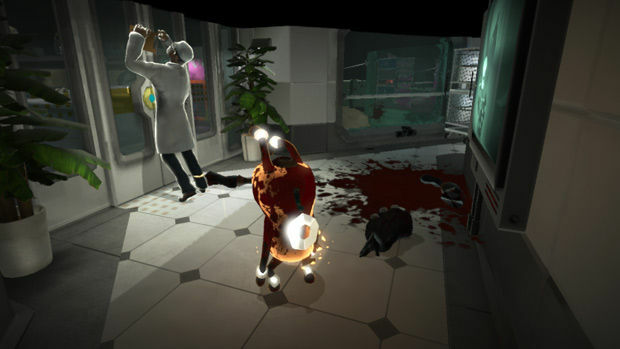 It really is incredibly hard to recover smoothly from a ragdoll-based collapse. 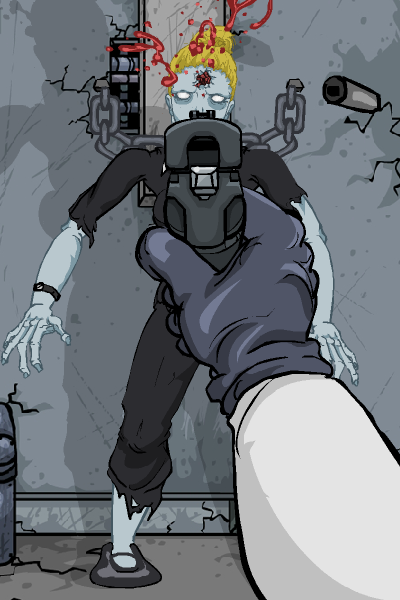 On the other hand, unless you have your artists make dozens of death animations, it'll always be easy to distinguish a "real" ragdoll death from a "fake" non-ragdoll death. 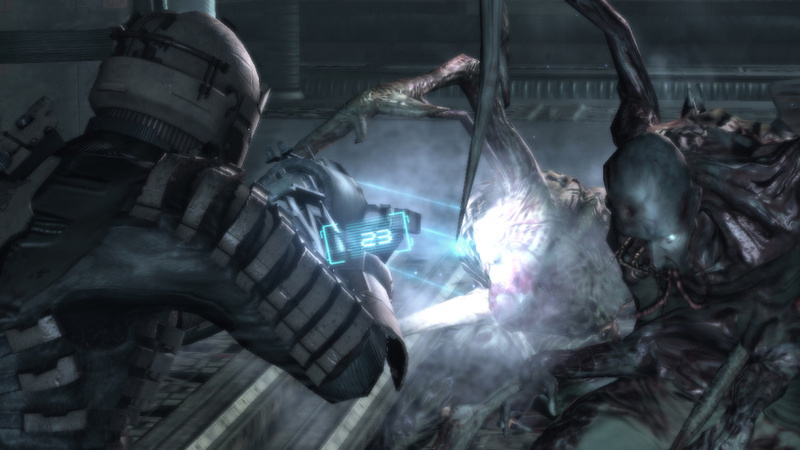 But it's a problem, and in a game like Dead Space, where detecting Proper Death is a very valuable skill, it's distracting like you wouldn't believe. Spoilers: I'm not sure how this would be possible. 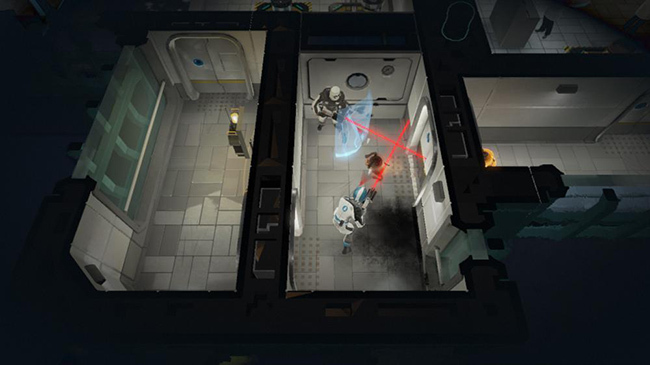 What this means is that you may be bombarded with short dissections of short downloadable games. I might eventually make a post about the PS3 in general (summary: it's pretty dang awesome now and Microsoft's lunch is about to be eaten by Sony) but I may not. The thing about small short games is that some of them are really really weird. Cocoreccho is an exception to this, mostly because I'm not entirely sure it's a game. 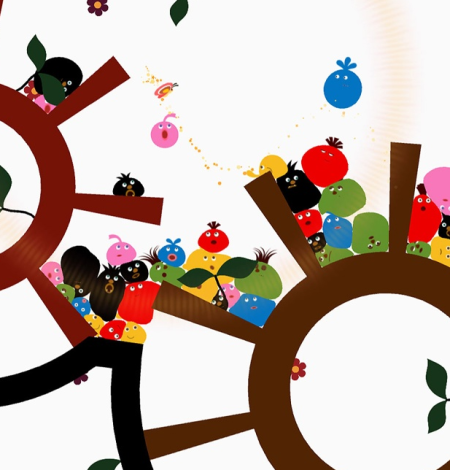 LocoRoco was originally a PSP game. You played the Earth, and tilted your surface to help a bunch of singing blobs defeat a small army of flying dreadlocked heads. I swear I am not making this up. 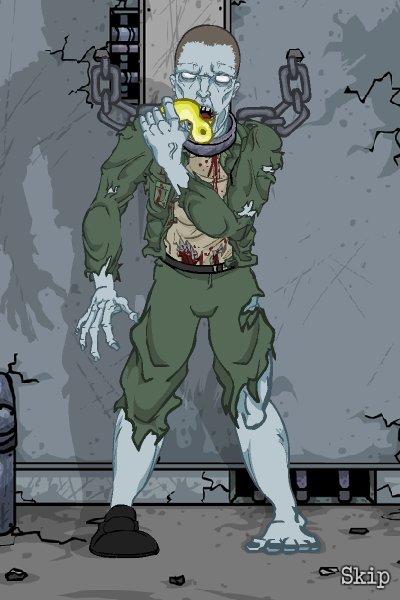 If you think the gameplay sounds distinctive, the art style was even more so, consisting entirely of deformable solid-color 2d cutouts – on the PSP, no less, where most people were expecting gore and explosions. Add to that one of the most catchy and cheerful soundtracks I've heard in a long time (keep in mind your blobs sing along, with lipsynched animations, in chorus) and LocoRoco made Nintendo games look dull, stodgy, and moderately depressed. It's a great game, and I highly recommend it. It's also a near-natural fit for the PS3's tilt sensor. All they had to do was port it over, add a bunch more levels, bam! Game! What they actually made was, in the words of the lead developer, an "interactive screensaver". 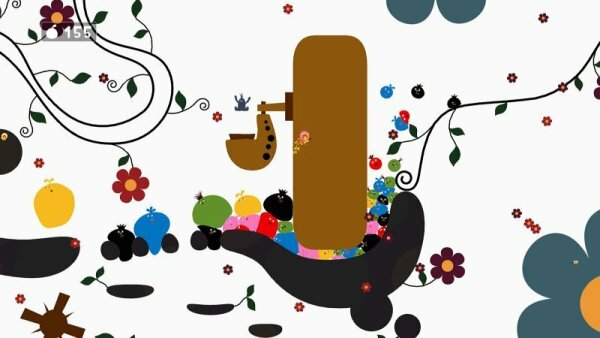 You still have a large number of singing blobs (it wouldn't be a LocoRoco game without singing blobs) but instead of getting from one side of the linear level to another, you are instead exploring what can be best described as a humongous Thing. Its behavior will be familiar to anyone who's played the PSP game, as it includes spinny things, bouncy things, sloped things, things with holes, and every other joyous device that we're used to from the PSP game. Your goal is to move a magical butterfly around which attracts singing blobs, use that explore the Thing, find more singing blobs, and wake them up. Unlike the PSP game, your little blobs have more autonomy than they did before. The Thing has several large "loops" of behavior in it, where the blobs will naturally wander down slops and jump into new areas with wind blowing them back up to the beginning, and your blobs will generally follow the loops on their own, meaning that even if you're not really paying attention they'll be wandering around the level without any help required. This is pretty dang neat – in many places you can just point the screen at a segment and let it sit while blobs fly through it. I'm pretty sure this is where the whole "interactive screensaver" part comes from. Unfortunately, as a screensaver, it's a bit of a failure. You see, the screen itself doesn't move around. Wherever you leave it, that's what you're going to be looking at until you move it again. And while the blobs are largely self-motivating, the areas they travel through automatically aren't really particularly interesting. In order to make them do anything of interest, you have to not only control the butterfly manually, but you have to know where the interesting things are – making it impossible to just sit down and poke at it for a few minutes. Getting anywhere really interesting can easily take fifteen minutes to half an hour of work. I'm going to diverge into philosophy here for a second. Games started as a thing that was Not Business. If you were using a computer for it, it was either Business or Games. It took quite a while for computers to be used seriously for any other sort of recreation (like reading blogs) and even then, it pretty much came down to Business, Games, or Communication. We're finally moving into using computers for other things. Cocoreccho is something I would consider Art. It's clearly meant to be art, on some level. Unfortunately, it's art jammed into the mold of Game. The artistic things they could have done have been hampered by their desire to make something that should be both played and won. Which is, I have to say, sad. It could have been something More – but it isn't, and it won't be, because it's a game and it's proved unable to break out of the template of Game. Cocoreccho is interesting. I'm not sure it's good. But it's interesting, and if what I've been talking about intrigues you, and you have a PS3, you might want to check it out.